This one's sitting on my shelf (ahh! I say that way too often these days!) but I think it's moving up my list. Whimsy is not something you find done well very often. Add in a way with words and you've completely captured my attention. I know, right?! I'm in awe of authors who do whimsy so well. I hope you enjoy it when you get around to it! Sounds great. I've heard of Moriarty but never read anything by her. I shall have to rectify that now. Glad to hear you liked it, Steph. I have it in my stack and have heard reactions across the board. This one makes me happy. Do you think you'll read it eventually, Angie? Would love to know how you feel about this one. I can never predict what you'll think of a certain book but I certainly know what I *hope* you'll feel...! I was not drawn in by the first two chapters, but your review makes me want to give it a second chance. I loved the cover too. Sarah, I wasn't fully drawn into the book until about a quarter or so of the way through. The first two chapters are definitely convincing, and I think it's one of those reading experiences where you'll need to let go and pour yourself into reading it for a few hours in order to get immersed. Hope you can give it another try sometime when you're feeling up to it! Thanks for the nudge, Steph. You were right: a few chapters more and I was hooked. It felt a bit young for YA but the writing was really good. I posted my review today. I'm a bit behind on my blog. It definitely was NOT an easy book to read whatsoever. Like you, I was confused for parts of it, but I did end up liking it as we drew closer to the end. There's just something about the whimsical, fanciful way it was written that appeals to me! Can't wait to hear what you think of this, Keertana! I'm so glad this was still available on NetGalley when I logged in the other day because you mentioned MEGAN WHALEN TURNER! Of course I'd want to read this. Wow, all you had to do was mention Megan Whalen Turner and I was like, I HAVE TO read this! I love that it started strong and ended in such an astonishing way. I've never read a single thing by Moriarty but I think it's about time that I start. This sounds so fascinating! I don't read nearly enough speculative fiction books that border on whimsical - I feel like those are usually geared towards a younger audience - but I'd definitely be willing to try a YA book billed as such. What has really sold me on this book is the fact that you consider the ending twist to be equal to Megan Whalen Turner's creations. 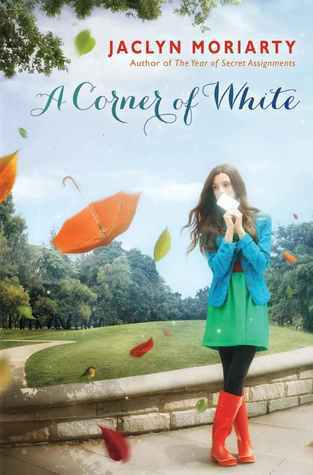 Not many authors can write as she does, so I am eager to experience A Corner of White for myself! I read this a few months ago (thanks to Mandee), but I haven't been able to write a review because I don't think I can do justice to this fantastic book. Steph, your review hits it out of the park. I love how you compared Jaclyn's words to color. I really hope people give this book a chance, even though I know it won't appeal to everyone. I can't wait to read the next book and I'm still pushing Feeling Sorry for Celia and Year of Secret Assignments on anyone I can. Can you believe Jaclyn will be at Festival of Books?? I FREAKED OUT when I saw her name. I really love seeing that this is epistolary as I always enjoy that technique; looking forward to checking this one out after all the buzz.